Colorado Parks and Wildlife posted a video to its Facebook page Monday that shows crews’ efforts to release a bear cub back into the wilderness. The baby bear suffered significant burns to its paws last summer as the 416 Fire raged north of Durango, mostly on the San Juan National Forest. CPW was able rescue the bear and rehabilitate it over the past few months. On Friday, crews placed the bear in a crate in a human-made den in the San Juan Mountains, west of Durango, along with another orphaned cub, also from the Durango area. The video posted Monday shows how crews were able to transport the bears and build their artificial den. Wildlife officials say the bears will hibernate until spring, when they will leave the den and begin life on their own. 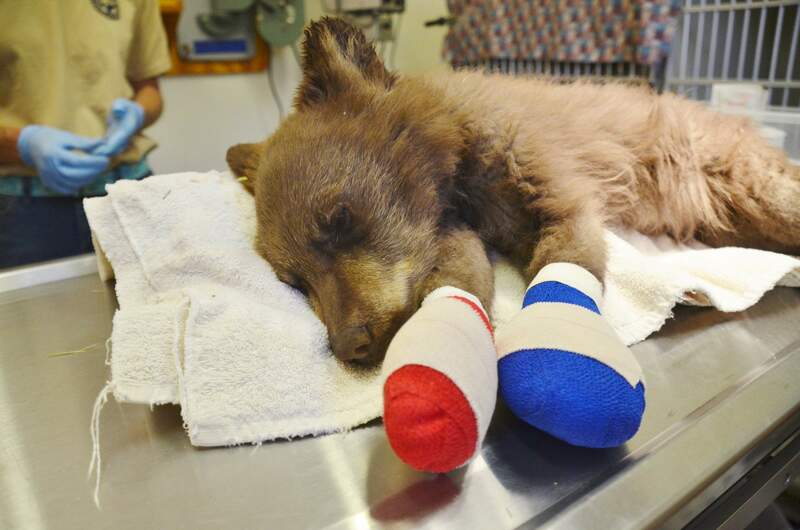 This female bear cub was found with burned paws as a result of the 416 Fire. The cub was rehabilitated for about six months before being released last week into the San Juan Mountains.